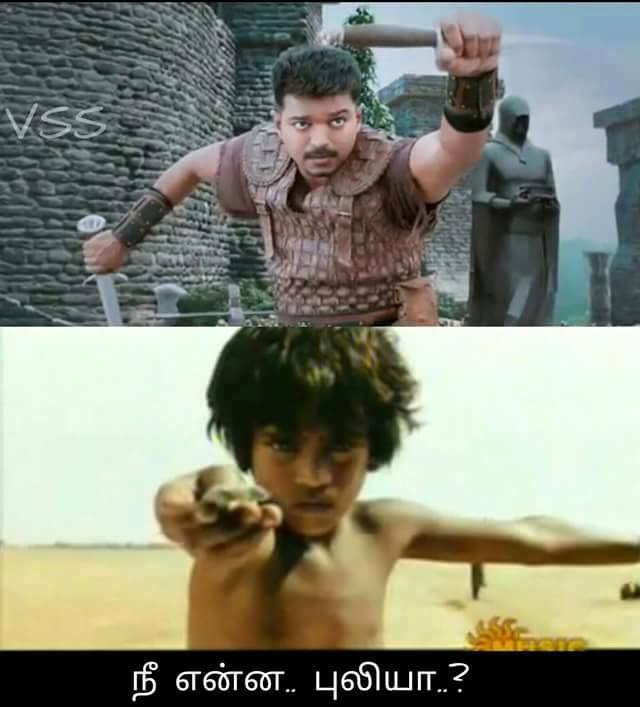 Looks like south superstar Vijay has again attracted endless social media memes about his recently released film teaser of Puli. Starring Vijay, Sridevi, Hansika Motwani and Shruti Haasan in pivotal roles, the film is an adventure fantasy that sees all the actors in peculiar ancient avatars. Fans have already started a Twitter war making it their job to ruin Vijay’s birthday by posting endless memes and cracking jokes relating to Puli’s teaser. While few fans are solely doing it for the purpose of supporting their respective fandoms, the others are just having a fun time trolling actor Vijay. As we all know, the matter of Vijay fans and VS Ajith fans has been going on since ages. Each time both the actors release a film, constant comparisons happen without fail. Similarly, Ajith fans started a trend on Twitter with the hash tag #VijayTheCurseOfCinema which is quite rude in our opinion! Actor Simbu came forward to urge fans to stop this immature antics in the name of supporting their favourite actor. Recently, Salman Khan had also urged his fans to stop bashing his fellow actors Shah Rukh Khan and Aamir Khan on social media in the name of fan following. The haters of Vijay did not stop thus doing the immature act again today with the hashtag of #VijayIgnoredRetardInCinema, which is trending in twitter now. Some of the other jokes were being made on Sridevi who dons the avatar of a queen in Puli. Sridevi was being mocked for allegedly rejecting Shivagami’s role in S.S. Rajamouli’s Baahubali to act in Chimbu’s Puli. Shruti Haasan also could not escape the twitter bash as her actions did not go unnoticed. Interestingly, Shruti who is one of the lead stars of Puli herself did not retweet the film’s teaser given Thala (Ajith) fans to make fun of the film even more. Nevertheless we certainly like Puli’s teaser and think that both Vijay and Ajith are legendary actors beyond comparison. So over enthusiastic fans set to destroy either actor’s film should stop with the childish acts of spreading hate. Other than that posts made solely for fun and entertainment that do not hurt anyone’s feelings are sportingly taken by the actors themselves. Let’s hope Vijay and his Puli team remain unaffected by these trolls!